Are you thinking of ways you can ask your Bridesmaids to be by your side on your special day? Do you want to ask them in a way that makes them feel special and let them know just how much they mean to you? Because lets face it, they’ve been there through thick and thin for you. Through the good times and the not so good – the break up’s, the bad hairstyle’s and the rest! Sometimes your closest girlfriends live on the other side of the world and it’s a matter of asking her over the phone. But if your one of the lucky one’s and have your gal pal’s near you why not spoil them with a little picnic that’s relaxing and in beautiful surrounds. The older you get in life you truly realise how important having your best friends in your life is. Even though you may not see or speak to them every day or week for that matter, knowing that when you are together again – it’s like it was yesterday that you last spent time together. A few weeks ago we put together a Bridesmaid proposal picnic styled shoot with a few very talented local Gold Coast vendors. We’d love to hear how you proposed to your bridesmaids or if you have been the bridesmaid that’s been proposed too. 10 Wedding Trends for 2018 from the team @ The Bridal Box Co. There are so many incredible new trends emerging for weddings in 2018 and we have created our top 10 wedding trends for you. From welcome boxes to what is hitting the runway, we hope you find some inspiration amongst our most-wanted list. Love it or hate it, the Pantone Colour of the Year, ultra violet is going to be seen strongly this year through bouquets, bridesmaid dresses, reception décor etc. A dramatic shade, it is original and desirable and is the colour to watch for all wedding designs in 2018. “The Pantone Colour of the Year has come to mean so much more than ‘what’s trending’ in the world of design; it’s truly a reflection of what’s needed in our world today.” – Laurie Pressman, Vice President of the Pantone Colour Institute. The personalised wedding box is proving to be a huge hit already for 2018, by showering guests in appreciation by giving them a one-of-a-kind welcome box. Think bonbonerie’s but bigger and more thoughtful. This is a fresh take on a traditional token gift and one that is going to make an impact. The most popular are personalised boxes that are filled with wine, flowers, candles, personal notes and wedding information for every guest to enjoy. Very popular for destination weddings to show gratitude for guests travelling so far. Looking for something original, memorable and fun, then check out food trucks as one of the hottest 10 wedding trends for 2018. Food trucks and food installations offer a unique dining experience and are replacing the traditional sit-down dinner for a more entertaining and interactive option. Rose gold was a huge hit in previous years and this has now moved onto the new element being copper. It is the perfect accompaniment to accentuate an industrial look and can be integrated into both the ceremony and reception through tea lights, cups, cutlery, flower vessels and lanterns to name a few. Copper is one design element to watch for 2018. Fun dessert tables are continuing to be a hit in 2018 with one of the favourites being a donut wall, instead of the traditional cake. The donut wall is the wedding décor that has never been sweeter, and features as a vertical donut stand that you can colour coordinate, you can shape into your initials or even integrate flowers into the donut wall. The possibilities are endless with this fun snack stand. This is a trend that has already been very stylish in 2017 and continues to dominate the most stylish weddings in 2018. Hanging flowers or greenery above tables create a unique dynamic to a space and also gives more room on tables if you’re choosing big sharing plates. Think timber, metal, copper and twig features throughout the hanging flower installations for an inspiring WOW factor. One trend we are beginning to see more of is the culling of the guest list. 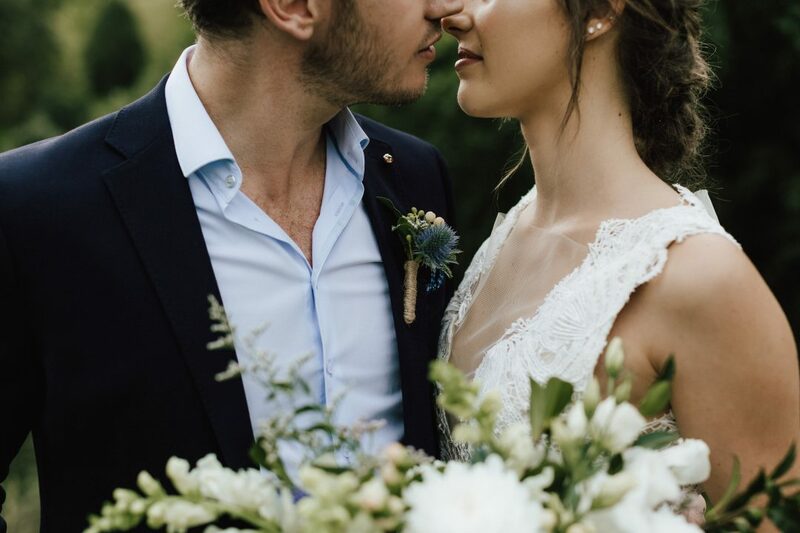 Smaller and more intimate weddings are making a come-back, with couples choosing to invite only family and friends that they are close with, as opposed to having a large, lavish wedding with guests that they haven’t seen in years (if ever)! Couples are choosing to use their hard earned money for their honeymoon, house deposit, holidays etc. Having a traditional guest book is always a lovely sentiment, however 2018 is showcasing inspired ways to capture guests’ well wishes. Some of the trends we are seeing are thumb print paintings and signed surfboards and we are sure to see a wave of new and innovative guest books in 2018. There are so many fun and unique ways to “pop the question” to your bridesmaid and this is an emerging trend for 2018. Gift boxes given over a champagne brunch or hand delivered to the bridesmaid door with a sweet personalised note saying that they can’t say I do without them, is a wonderful way to begin the wedding planning journey. There are a plethora of new trends hitting the Bridal Fashion Week runway in 2018, however some of our absolute favourite trends are the princess capes, cascading ruffles, sheer corsets and the fabulous statement bows. Simply divine and such statement pieces. So, he (finally) popped the question, and you haven’t been able to wipe the smile off your face, nor stop showing off that beautiful engagement ring he bought you. But things can sometimes get stressful once you start getting into the nitty gritty of selecting your bridesmaids. I think secretly most non-engaged women have had the thought maybe once or twice for when the time came they got engaged, who they would ask to be by their side. Now that time has come for you, and you may possibly be filled with anxiety over who you want to choose and who is expecting to be chosen. Firstly, think about how many bridesmaids you ideally want to have. How big is your wedding guest list going to be? Is your wedding very traditional and formal or super relaxed and casual. If you were having a wedding with approximately 50-60 guests and were looking at having 6 bridesmaids it could possibly look a bit over kill. Think about who is closest to you. Write down a wish list and cross check it with your fiance’s list (yes, it’s a good idea to let him have some input too). See if the numbers line up or if you need to start culling. This is where you need to think about your closest family members vs your besties. Remember that family will always be there in 10 and 20 years, friends (no matter how close at the time) do come and go out of our lives sometimes. Now as you are finding out weddings need a lot of preparation and planning, and you need people you can trust to help take some of the weight off you and remind you that it’s a very fun and exciting time of your life. Your Maid/Matron of Honour needs to be someone you can rely on as she is usually the Brides right hand woman and her duties are to organise your Hens day/night (or lets be honest – weekend!). The Maid of Honour helps you with decision making leading up to the big day and ensures the little things on your wedding day morning are running on time. . she also needs to bring your Bridesmaids into line if need being. And these are just a couple! Think about your needs and expectations, do you want them available every weekend? Is it going to reduce your anxiety knowing they are only a few minutes away or if they are in another city or state, will this impact on your planning. You also need to factor in what they have going on in their own life. Do they have a stressful job? Are they trying to have a baby or engaged themselves? Choosing your bridal party can be a total headache these days. My best friend recently had so much anxiety over selecting her bridesmaids from her large bunch of amazing friends & family, she was really nervous at putting a label on her friendships and though she had a close friendship with a lot of different girlfriends, there were just too many to choose from and she didn’t want to hurt anyone and make them feel lessor of a friend than another. As her hubby to be was having similar issues and to prevent it from getting way out of hand they decided to get married with no bridal party at all. Their nearest & dearest will still be a part of their pre-wedding planning & activities but with no formal titles and no favourites. Your family & friends can definitely force some decisions onto you whether you like it or not, and who you choose can sometimes have repercussions. Hopefully at the end of the day your loved ones will understand your choices and be nothing but thrilled for this exciting time in your life. Q. Maid of honour and Matron of Honour. Do you know the difference? What will you choose? A. Your Maid/Matron of Honour is your head bridesmaid. Traditionally, Maid of Honour is the title given to a woman who is unmarried and Matron of Honour is the title given to a woman who is married.